Rural communities around the world traditionally take their water supply from rivers or from shallow dug wells. Growing concentrations of people combined with the increasing industrialization of land use have resulted in many major rivers becoming highly polluted. Sometimes the pollution levels even cause the rivers to become biologically dead and poisonous to drink. In areas where surface water is not readily available, groundwater is the primary water source and serves an estimated 20% of the global population who live in arid and semi-arid regions.4 Underground aquifers are slower to show problems but now are increasingly affected by contamination that is extremely difficult to undo. Treatment of contaminated drinking water is possible at an urban or a community scale, but it requires financial and human resources not often available. Even when provided, the quality after treatment is often still uncertain and remaining subtle pollutants in trace quantities can still pose health risks (such as the infamous “gender benders” which are believed to upset human hormone balance). The efforts to reduce or prevent pollution of critical waters are numerous, but the scale of the challenges is enormous. River basins containing tens of millions of residents are almost unmanageable, given the weak capability and tools that are normally available and the low priority that is usually given to reducing pollution. This attitude is changing as the human and economic costs are recognized, but the timescale for major improvements is probably decades, at least in the larger systems. Key pollutants in the water systems are typically pathogens arising from human waste (bacteria and viruses), heavy metals and organic chemicals from industrial waste. Ingestion of pathogens through drinking contaminated water or with food prepared using contaminated water is the most common pathway. Eating fish from contaminated waters can be risky, since they can absorb and concentrate both pathogens and toxics such as heavy metals and persistent organics. In addition, human health may be affected by crops that take up pollutants from contaminated water used for irrigation or from land flooded by polluted rivers. Toxic contaminants in fish or other foods are less likely to cause acute poisoning but can have serious long-term effects, depending on the pollutants and the doses. Understandably, fishing communities along rivers are particularly at risk since they have a steady diet of the local fish over many years. Water quality problems are affecting virtually all of the developing world’s major rivers. Northern India suffers immense flooding in its river systems but in the dry season, pollution problems dominate, especially in the upper reaches, including around New Delhi. In China, industrialization has created serious problems in rivers such as the Huai, where large sections of the river are acknowledged to be in the lowest possible water quality classification. Similar problems exist in many other urbanized waterways. India has a Ganga Action Plan, launched in the 1980’s to reduce the pollution of the river Ganges, but measurable progress has been slow, despite the expenditure of hundreds of millions of rupees. In China, investment of billions of dollars over twenty years (along with closure or relocation of many industries) has produced a significant improvement in the Huangpu River in the centre of Shanghai, but increasing upstream loads from urbanization and industry are causing measurable deterioration even in the mighty Yangtze. These programs reflect the decades of effort and investment that are needed. The experience of the west on rivers such as the Rhine and the Thames has demonstrated that rehabilitation is eventually possible. Better off communities can afford water treatment systems and wealthier people can take avoidance measures such as tankered or bottled water from safe sources, but the poor have limited options and need to look towards provisions of public water supplies. Unfortunately, many developing nations face their own public water challenges. 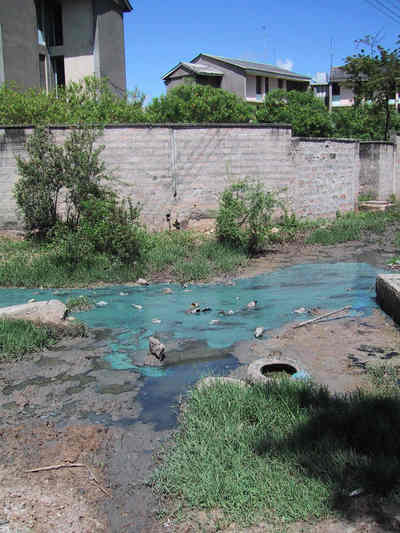 Where the problem is localized or can be linked clearly to a few specific sources or pollutants, smaller scale interventions can be effective, in terms both of achieving some improvement to water quality and also of starting a longer-term process. However, large amounts of time and resources are typically needed. 1 Gleick, Peter H. “Basic Water Requirements for Human Activities: Meeting Basic Needs.” Pacific Institute for Studies in Development, Environment, and Security. International Water Resources Association. Water International, 21 (1996) 83-92. 5 Rijsberman, Frank R. “Water scarcity: Fact or fiction?” Agricultural Water Management. 80.1-3, (2006) 5-22. Chromium polluted surface water. India. Photo by Blacksmith Institute. Polluted surface water. Dar es Saalam, Tanzania. Photo by Blacksmith Insitute.